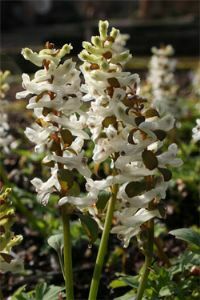 Unusual cream and brown flowers over attractive foliage appear in the early spring. It slowly makes a clump from unusual shaped corms. Cool semi-shade is what this Corydalis prefers. A good addition for the Corydalis collection. The plants are grown from divisions although they might produce seedling of different colours. Plant 6cm deep. 15cm tall.